Contrary to this cover, you don’t actually race against any other car in the game. Safari Race should be the sequel to Safari Hunting, but – spoiler alert – it isn’t. Whereas the latter was Sega’s love letter to poaching, the former is a one-man trek through the African Savannah in a sleek mid-80s sports car. 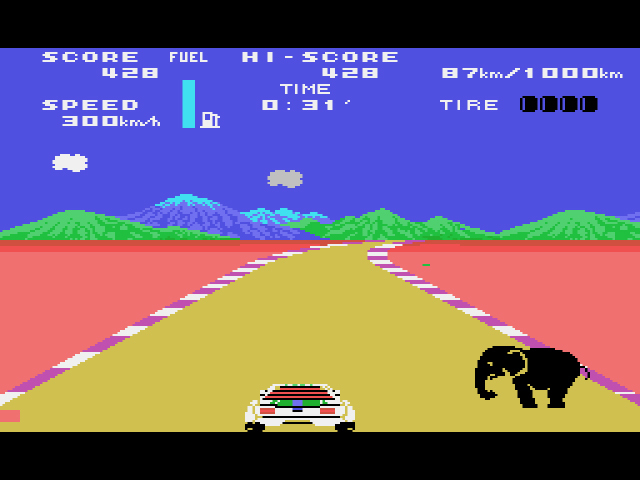 Speeding on a highway by yourself was a pretty standard idea in gaming circa 1984, but imagine an alternate Safari Race where you drive alongside rhinos, elephants, and gazelles in miniature sports cars. As you approach said wildlife, you choose whether to shoot them for bonus points (you monster) or let them go free and get more fuel (both saving and destroying Earth’s precious resources). Too ambitious? Probably! Still, I’d rather play ten ambitious disasters than travel through the Land of Uninspiration that is Safari Race again. 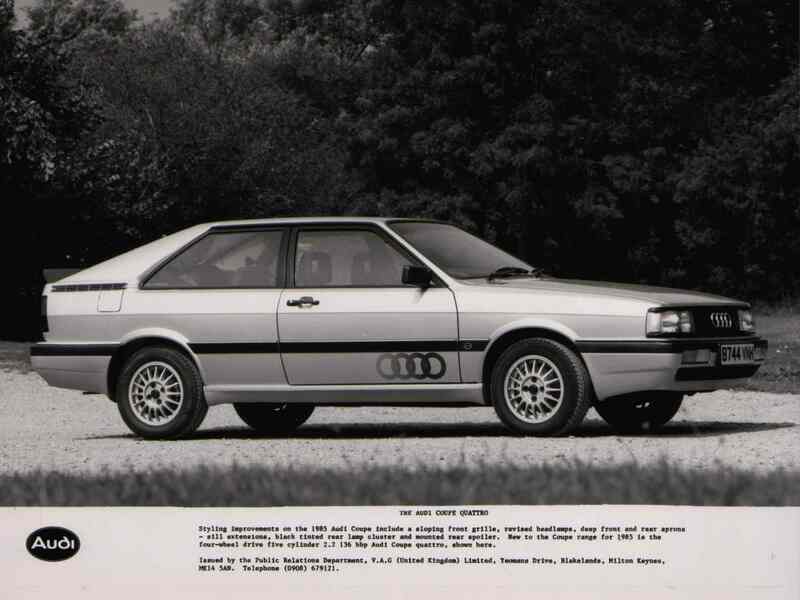 Why aren’t you in a sports car like mine, Mr. Elephant? In Safari Race, you speed along on a highway in the middle of the desert, avoiding poorly rendered rhinos, gazelle herd, elephants, and other miscellaneous highway debris like… office safes? And boulders? Sometimes it’s hard to tell what’s on the road ’cause of how transparent and crap everything looks (except the mountains in the background, which look gorgeous). Why are you racing in the desert? ‘Cause racing in Africa was what the cool kids did back in the 80s – Bono and Springsteen and all those hip rockers used to ‘thrash on the pedal’ and ‘bust it up’ and other outdated slang. To put it another, more truthful way, you’re trying to reach a certain distance on the highway before your time runs out, and the animals in the Serengeti have had just about enough of your greased-out shenanigans. If you hit an animal or another car, your car will bust up in the middle of the road. You have four tires which represent lives, and once you’re broken down, a tire will levitate down from the top portion of the screen and get your car running again. Keep in mind, though, that you have a limited time to get to the end of your goal, and the clock is always running, even if you’re broken down or stopping for fuel. Having to refuel so often is where Safari Race breaks down for good. Blue gas pumps will intermittently appear alongside the highway, and if you don’t stop at every one, you will run out of fuel. Trouble is, you have to align your vehicle perfectly next to the pump or the car won’t get any gas. If you’re off by a quarter-pixel or so, no fuel for you and you can’t drive in reverse to go back to the pump. The time limit forces you to go fast too, so it’s not uncommon to be racing at three hundred kilometers an hour, then slam on the brakes when a blue pump suddenly appears in your view. The constant jerky race-stop-race-stop disrupts whatever flow Safari Race tries to establish. I asked for premium, not mid-grade! Ugly graphics, busted mechanics, and lastly, confusing controls. When you begin Safari Race, you push up on the joystick and your car moves forward before getting stuck at eighty kilometers an hour. I knew I could go faster, so I pressed Button I, but that only honked the horn (what a useless feature – if the horn doesn’t do anything, why assign it to a button? For “realism”? Bah!). Button II slammed on the brakes. Turns out, you have to push up, then down on the joystick to reach higher speeds. Like shifting in a car, sure, that’s what Sega was trying to replicate. Except there’s no logic in pressing down to move forward, ever. You get used to the reverse logic, but Sega should still be ashamed of themselves for putting these backwards controls in the finished product. Safari Race would be the most forgettable racer Sega’s ever been associated with if not for the honest-to-God licensed cars found within the game. 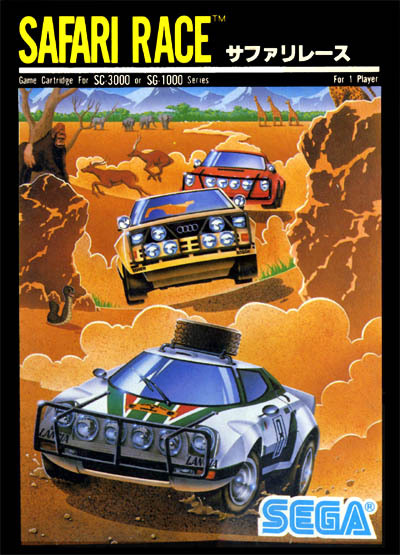 According to the back of the Safari Race box, the player controls a Lancia Stratos HF and the other cars on the freeway are Audi Quattros. How did Sega get these?! Not only is this one of the first examples of car licensing in any game ever, but these are high-quality enviable vehicles that Sega rendered with a lopsided amount of care. The Lancia Stratos resembles the car it’s modeled after, but the Quattros resemble Trans-Ams from a generic LCD handheld game. If someone could find out how much money Sega spent in order to acquire the cars, that would be super. My suspicion is that the licensing fees far outweighed both the development cost of the rest of the game and whatever profits Sega received from the game’s sales. That’s not the Quattro I grew up with, Sega. Licensed cars aside, it’s obvious that Sega put little time or energy into Safari Race. I suggest we all do the same. This review was fun to read. Nice! How you make the review read makes the game sound really cool. Unfortunately it must not be. That car looks super sweet. This game that I had never heard of definetly seems to go with Segas early Safari line of games. Such an odd premise for a game. I highly doubt they had to pay much licensing for the cars. I think when this came out the Video game market was so small that fees where probrably still very negligible. The days of high fees for official products were way in the future at this point. I know you gave it an F, but I kind of want to try this game now. 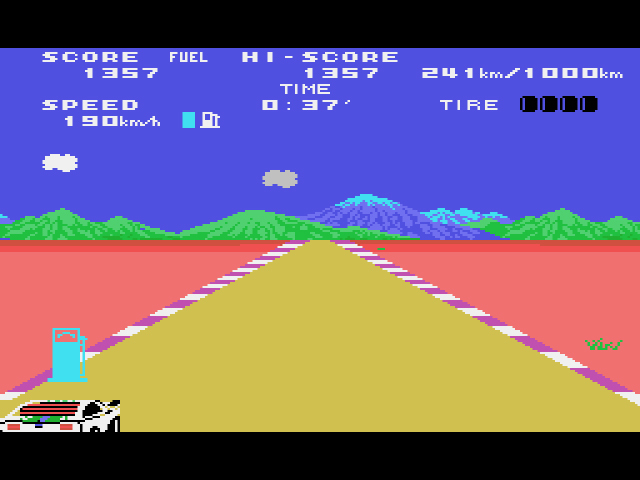 Also I think the control seems in line with a lot of pre 1985 racers I’ve played on older systems. I can’t think of a concrete example at the moment, but I know I’ve played Atari 2600and other early racers with convoluted controls for shifting gears. 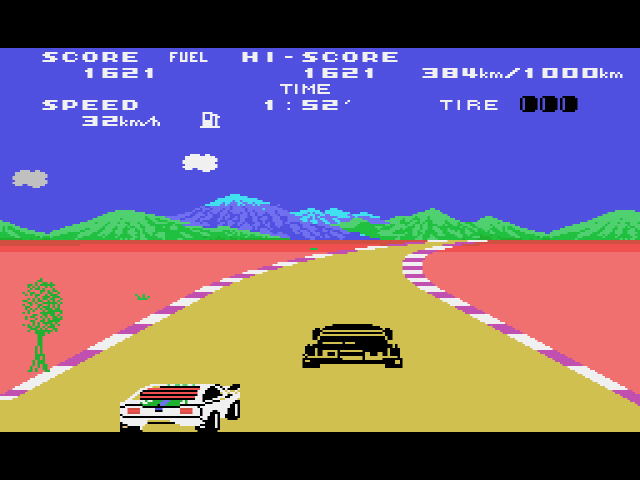 I wish I could remember the game for the life of me but there is a racer back in the day that I literally went months playing before I figured out how to shift to high gear. Was literally racing in low gear all the time before I figured out here was a higher speed. By all means, give Safari Race a try and let me know what you think. I have a feeling Sam and I are going to have fun discussing this one. Convoluted controls may have been the only way to simulate shifting gears back in the day, but I’m not sure that’s an excuse to make ‘Down’ move the car forward. Backwards, I say! So I miraculously acquired a complete SG-1000 library today and decided to check it out. The control clicked with me right away. It even made me remember what game I played with the same scheme. Pole Position on the Atari 2600 had the exact same control scheme and I think some future Sega racers as well. I looked up the manual for a Pole Position and it was also up for low and down for high gear. So commenced playing and it worked well for men just holding down while tilting right or left. It came back to me pretty quickly since I had used this scheme before. And it took me maybe 10 times to get past the first stage. Those damn fuel pumps sucked. I couldn’t figure out how to stop in time to not pass them up. Until I did. The key was Immediately pressing up to go to low gear and jamming the break like a mother. Doing that I would always break in time or pull up just before it and have to inch forward a bit. But then I couldn’t line up with the pump to refill a majority of the time. Until I could. I found the key is you have to hold right or left to drive off the track and keep holding it and you will activate filling. If you try to line up with it and stop in front which was intuitive you’d miss it. But if you held off the track and didn’t let go I found the range for refueling was pretty large. From about the front of your car to the rear wheel. After I figured that, I beat the first two courses and made it halfway through the third (and final?) course. I only lost because I passed up a pump by not stopping in time around 1/2 tank. I ran out of fuel but was coasting down and came on another pump I could have reached. But I breaked too hard and came up a couple of feet short. And since I was out of gas I couldn’t inch forward. I found you don’t have to hit every pump, but if you have less than 2/3 tank you better get it. But other than that, steering to avoid the cars and animals was pretty easy and you just had to brake a bit around sharp corners. There wasn’t really much to it. The main skill in the game is hitting those fuel pumps. Occasionally you’d be pulling out from refueling and a car would run over you which was pretty cheap. But other than that once you figured out how to reliably fill up it was a piece of cake. The graphics were a lot better in motion than the screenshots show, but this is my first SG-1000 game so I don’t really have much to judge on. I’d give it a D or maybe a C minus. But until you figure out those fuel pumps I was totally ready to say this was an F after taking 10 times to beat the first stage.